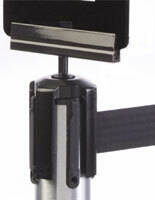 This Post Top Bracket is for Tensabarrier Stanchions! 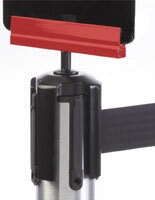 The Stanchion Accessory Holds Signs On Your Crowd Control Posts! 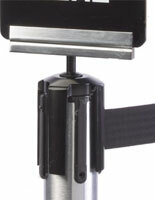 This is bracket designed to display 7" x 11" signs for Tensabarrierrs. 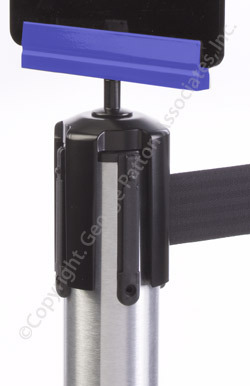 This frame is blue and fits any of the Tensabarrier Retractable Stanchions sold by StanchionsDirect.com. 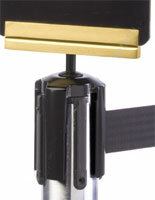 This matches our colorific blue posts, and includes the adapter to mount it to the post. 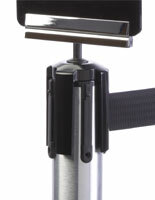 The bracket swivels infinitely, easily change the direction it faces simply by spinning it. We have several Stock Signs that are designed to fit this frame. 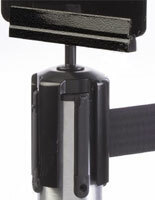 Please Note: This sign bracket fits only Tensabarrier® Stanchions (sold by StanchionsDirect) and will not fit posts from other manufacturers or with other brand names.